How do I know I’m an artist? The same way I know I am a nurse: Not because I am paid for my work, but because of my commitment to nursing. Commitment manifests itself as time set aside for continuing education, and time to practice skills. It’s not enough to want to do something. 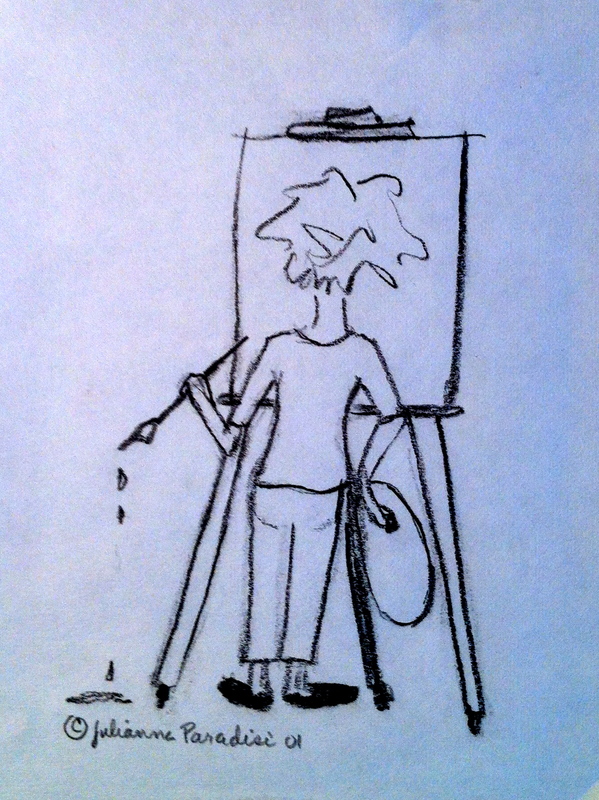 You need time to practice skills, whether it be starting IVs, or developing a series of paintings for exhibition. You commit to nursing through education, taking boards, and continuing education. You have to commit to creativity, too. Begin with one hour a week, every week. It needn’t be the same day or time each week, although a set schedule may make it easier, childcare and weird nursing work schedules may necessitate flexibility. Protect this hour as if it were a difficult-to-reschedule dental appointment. Wander the aisles of an art supply or craft store. Give yourself $10-$20 to spend on pens, paper, stamps, inkpads, dried flowers — whatever. Need ideas? Check out MarthaStewart.com, or Pinterest. Wander the aisles of an office supply or dollar store with $10-$20. Buy felt pens, stickers, glitter, glue sticks, and an inexpensive scrapbook. Tear pictures from old magazines of everything catching your eye. Paste them into the scrapbook using a glue stick. Decorate the pages with your glitter, stickers, and felt pens. Buy a cheap rectangular or square flower vase made of clear glass. Fill it three-quarters full with small glass beads. You can use small, polished stones instead, but they tend to scratch the implements. Use it to hold pens on your home or work desk. The important thing is to make a habit of allowing yourself at least an hour a week to explore and develop your creativity. What ideas can you add to this list? While running on the Eastbank Esplanade along the Willamette River the other day, I saw a trio of young siblings torturing one of the trees that struggle to grow in the exhaust fumes underneath the freeway near the Hawthorne Bridge. The tallest child, a girl about ten years old, pulled violently on the low hanging branch of the leafless tree, while her brother beat at it with a large twig. The smallest child danced around the two of them, a blur in her pink parka. Nearby, their father sat on a bench, talking on a cell phone. Smiling, he watched his children play and enjoyed a brief interlude to himself. I am mindful to avoid becoming that nasty little old lady I knew as a child. You remember her. She was the one who called your mom complaining that the flowers you brought home from school were stolen from her garden. She called your mom again when you and your friends threw the apples that fell rotten from her tree at one another: you never understood why she cared, they were there for the taking in the street. Oh, don’t forget the time you drew pictures with chalk on the sidewalk near her house. Even your grandparents scolded you for that one and you had to go back with a can of soapy water and a rag to scrub your work off of the pavement. She narked on other kids in the neighborhood too and on Halloween her house was specially targeted for toilet paper streamers and raw eggs thrown by the older ones. I heard my friend’s mother say the next day, “Why would anyone do that to such a nice old lady?” Was she kidding? I don’t want to be that old lady, so I held my tongue as I ran by. A few yards away, I watched and the children stopped what they were doing, releasing the tree. I observed that the boy ran with his long twig and the whirling pink girl held one too, as if it were a magic wand. Only the tallest girl didin’t have a twig and was unable to join her sibling’s play. I found a long, slender twig on the ground next to me and walked back to the children, placing it on the sidewalk near them. The pink girl saw me do it and took the offering back to her older sister. Perspective is an important consideration when composing a drawing or telling a story. Empathy for the perspective of others is essential for peace. I hope I remember this as I make my way through life. I also hope that those kids don’t poke their eyes out.